I’ve lived in Calgary for over ten years now and it wasn’t until I became a parent that I began to explore the nature on my own doorstep. We escaped to the mountains to go hiking every weekend, but I never knew that I could go for a hike without ever leaving the city limits. Nobody had ever told me how vast the City of Calgary’s natural areas were and that from any community in Calgary you could quickly find nature by just stepping out your front door. The city maintains over 5,600 park sites and nearly 800 kilometres of pathways spread out over 10,000 hectares of parkland. 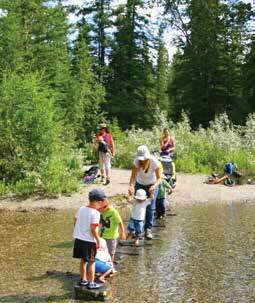 Explore the city’s natural areas and you’ll discover something new around every corner – from natural springs and waterfalls to wooden boardwalks, oxbow wetlands, forests with towering Douglas fir trees, and a pond with a bridge made out of stepping stones. I challenge you to take the children out this summer to explore some of our favourite family-friendly rambles. Nose Hill Park is surrounded by 12 communities and covers an area of 11 km2 in northwest Calgary. I love this park because in many places you honestly can’t tell you are in the city anymore, all you see when you look around is prairie, grass, and a big blue sky. Nose Hill parking lots can be accessed from Shaganappi Trail, 14th Street, and John Laurie Boulevard. We usually start from the parking lot at John Laurie Boulevard and Brisebois Drive and head straight for the quarry. To find the quarry, follow the paved trail up to the top of the hill and then proceed straight north on an old gravel and dirt road – you really can’t miss it. If you look carefully, you might find a porcupine hiding in a tree, see the stones from an old tipi ring, or even see a deer hiding in a thicket. 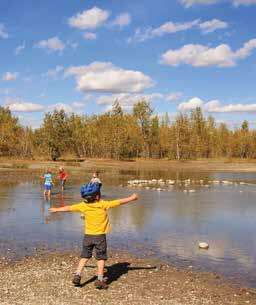 If you’re going to visit the quarry, be prepared with rubber boots, a change of clothes, and some wet wipes to clean muddy children and pets before getting in the vehicle afterwards: the quarry usually fills with water creating a pond for children to play in. A rock bridge across the middle guarantees at least one child will fall in and come home wet. 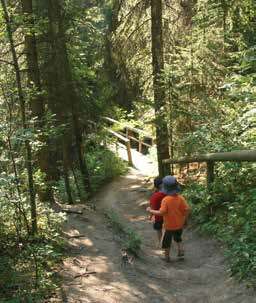 The Douglas Fir Trail is one of the most well-known hikes in Calgary and is located in Edworthy Park on the southern bank of the Bow River. If you access the park off Spruce Drive in the southwest, you’ll be parked right beside the Bow River Pathway on the south side of the train tracks that run through the park. Follow the paved regional trail heading east until you come to the official sign for the Douglas Fir Trail. Truly a gem in our city, the trail will have you walking over wooden boardwalks and climbing flights of stairs as you make your way to the top of an escarpment looking down over the park and the river. The trail winds its way through a beautiful forest that is scenic even on an overcast or rainy day. Note that if it’s raining however, the boardwalks get very slippery and extreme caution is required. The trail is also closed in winter and early spring due to ice caused from natural springs found along the path. The trail is 2.5 kilometres long from Edworthy Park to Cedar Crescent SW. From there, return the same way you came or make your way down to the regional pathway and return on the paved trail. Many people also hike to the high point at the top of the stairs and go back down again for a shorter hike with small children. I was never so impressed with our natural areas as when I discovered the incredible Waterfall Valley in the Bowmont Natural Environment Park. 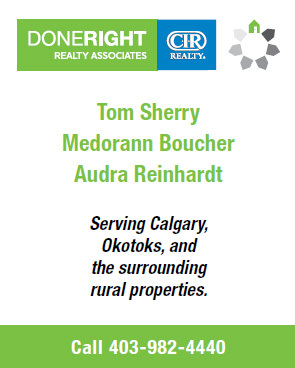 The Bowmont area stretches all the way from Bowness Park in the northwest to the community of Varsity further east as it follows the northern bank of the Bow River. It passes by the Silver Springs Golf and Country Club and eventually ends at Home Road a few blocks away from Market Mall. While the park offers a myriad of trails to explore, our favourite is the little known Waterfall Valley Trail. It is located just off the paved trail that winds through the park and is accessed from the bottom of Silver Springs Blvd at the intersection with 54th Ave NW. Park on the street beside the large sign for Bowmont Natural Environment Park and follow the paved pathway heading west. You’ll see the sign for Waterfall Valley within a few hundred metres and you’ll descend down into the valley towards the river. 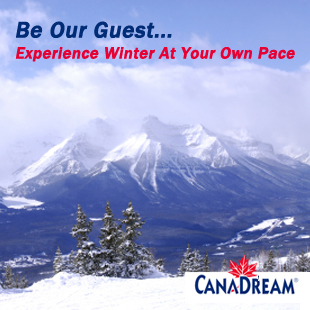 You’ll be following wooden boardwalks and stairs as you make your way to a set of natural springs near the Bow River. The river is not currently accessible from this trail but there are plenty of natural trails you can take from further up the trail heading west if you want to make your hike longer. 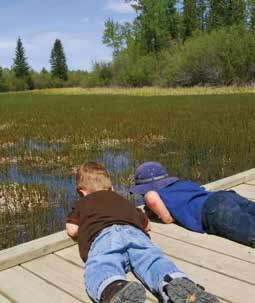 There’s nothing quite like the Weaselhead Natural Area in all of Calgary. This city treasure truly takes you far away from it all as you follow the meandering Elbow River past Oxbow Wetlands, over wooden boardwalks, and through Calgary’s only delta. To access the area, look for the signed Weaselhead parking lot at North Glenmore Park at the bottom of 37th Street SW. You’ll be right beside the paved regional pathway that descends a large hill towards South Glenmore Park. From your starting point looking down on the west end of the Glenmore reservoir, head southwest on the regional pathway and make your way down to a bridge that crosses the reservoir. 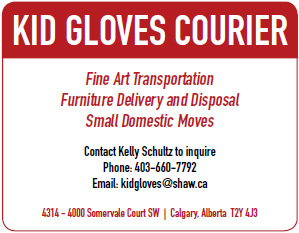 You’ll see the sign for the Weaselhead Area shortly after you cross the bridge. A trail map can be found at the trailhead so plot out your route and make note of intersections you’ll want to remember later. The orange loop is the most scenic and offers you a complete tour of the area. 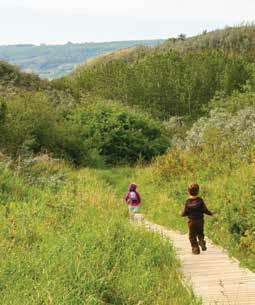 Families with young children can double back on the green trail which features a short boardwalk. Griffith Woods is another natural area located along the banks of the Elbow River in the southwest community of Discovery Ridge. There are several entrances into the park from the south side of Discovery Ridge Boulevard, but the official parking lot is found off Discovery Ridge Cove and Discovery Ridge Link. The paved pathway through the park is great for biking, and the natural gravel paths are also fun to bike or hike as a family. Hiking in Griffith Woods feels like you’ve discovered a secret forest in the middle of the city with a meandering creek and bridges throughout. What you’re really looking for though is the pond with a bridge made out of stepping stones. While it’s a bit of a scavenger hunt to find, the natural path is on the northwest side of the park, north of the power lines. Once you find it, you’ll remember where it is.